SIDREA - Società Italiana dei Docenti di Ragioneria e di Economia Aziendale | Le sfide evolutive del Management Control tra relazioni strategiche, innovazione e discontinuità: a knowledge transfer matter? Amason A. (1996), Distinguishing the effects of functional and dysfunctional conflict on strategic decision making: resolving a paradox for top management teams, Academy of Management Journal, 39, pp. 123-148. Doi: 10.2307/256633. Anthony RN (1965), Planning and control systems: a framework for analysis, Boston, Harvard Business School Division of Research. Argote L., Ingram P., Levine J.M., Moreland R.L. (2000), Knowledge transfer in organizations: Learning from the experience of others, Organizational behavior and human decision processes, 82(1), pp. 1-8. Doi: 10.1006/obhd.2000.2883. Ax C., Greve J. (2017), Adoption of management accounting innovations: Organizational culture compatitibilty and perceived outocomes, Management Accounting Research, n.34, pp. 59-74. Doi: 10.1016/j.mar.2016.07.007. Bennet M., Bouma J.J., Ciccozzi E. (2004), An istitutional perspective on the transfer of accounting knowledge: a case study, Accounting Education, vol. 13, n. 3. Bertini U. (2012), Il governo dell’azienda, la politica aziendale e le strategie, in Sinergie, n. 87. Bihimani A. (2009), Risk management, corporate governance and management accounting: emerging interdependencies, Editorial Manage Account Research, 20, pp. 2–5. Bititci U.S., Carrie A.S., McDevitt L.G. (1997), Integrated performance measurement systems: a development guide, International Journal of Operations and Production Management, vol.17, n.5, pp. 522–535. Doi: 10.1108/01443579710167230. Caglio A., Ditillo A. (2008), A review and discussion of management control in inter-firm relationships: Achievements and future directions, Accounting, Organizations and Society, n. 33, pp. 868-989. Doi: 10.1016/j.aos.2008.08.001. Carayannis E.G., Campbell D.F. (2009), Mode 3’and’Quadruple Helix’: toward a 21st century fractal innovation ecosystem, International Journal of Technology Management, 46(3-4), pp.201-234. Doi: 10.1504/IJTM.2009.023374. Chiucchi M.S. (2014), Il gap tra teoria e prassi nel Management Accounting: il contributo della field-based research, Management Control, 3, pp. 5-9. Doi: 10.3280/MACO2014-003001. 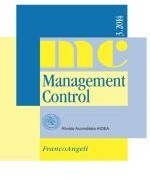 Cinquini L., Nørreklit H. (2015), “Management Control” Special Issue: Research perspectives in Performance Management, Management Control, Special Issue 2, pp. 5-12. Doi: 10.3280/MACO2015-002001. Copley F.B. (1923), Frederick W. Taylor: father of scientific management, New York, Harper. D’Alessio L. (2008), Le aziende pubbliche. Management, Programmazione e Controllo, Napoli, Liguori. DeMartini C. (2014), Performance Management Systems. Design, Diagnosis and Use, Berlin, Springer-Verlag. Etzkovitz H. (2008), The Triple Helix, London, Routledge. Flatten T.C., Greve C.I., Brettel M. (2011), Absorptive Capacity and Firm Performance in SMEs: The Mediating Influence of Strategic Alliances, European Management Review, Vol. 8, no. 3, pp. 137-152. Garrison R.H. (1991), Managerial accounting, Irwin, Homewood. Gatti M., Chiucchi M.S. (2017), Context matters. Il ruolo del contesto negli studi di controllo di gestione, Management Control, 3, pp. 5-10. Doi: 10.3280/MACO2017-003001. Giovannoni E., Maraghini M.P., Riccaboni A. (2011), Transmitting Knowledge Across Generations: The role of Management Accounting Practice, Family Business Review, 24, 2, pp. 126-150. Hakansson H., Ford D., Gadde L.E., Shenota I., Waluszewski A. (2009), Business in Networks, New York, John Wiley & Sons Ltd.
Hines R.D. (1989), Financial Accounting Knowledge, Conceptual Framework Projects and the Social Costruction of the Accounting Profession, Accounting, Auditing & Accountability Journal, vol. 2, n.2. Doi: 10.1108/09513578910132268. Johnson H.T., Kaplan R.S. (1987), Relevance lost: the rise and fall of management accounting, Boston, Harvard Business School. Kaplan R.S. (1983), Measuring manufacturing performance: a new challenge for managerial accounting research, Account Rev 58, pp. 686–705. Doi: 10.1007/978-1-4899-7138-8_14. Lawton-Smith H., Glasson J., Chadwick A. (2005), The geography of talent: entrepreneurship and local economic development in Oxfordshire, Entrepreneurship & Regional Development, 17(6), pp. 449-478. Liyanage C., Elhag T., Ballal T., Li Q. (2009), Knowledge communication and translation–a knowledge transfer model, Journal of Knowledge management, 3(3), pp. 118-131. Doi: 10.1108/13673270910962914. Love E.G., Cebon P. (2008), Meaning on multiple levels: the influence of field-level and organizational-level meaning systems of diffusion, Journal of Management Studies, Vol. 2, n.45, pp. 239-267. Doi: 10.1111/j.1467-6486.2007.00739.x. Mancini D. (2011), L’azienda-rete e le decisioni di partnership: il ruolo del Sistema informative relazionale, Management Control, 1, pp. 65-97. Doi: 10.3280/MACO2011-001004. Mussari R., D’Alessio L., Sostero U. (2015), Il nuovo sistema contabile delle università, Azienda Pubblica, 28, 3, pp. 227-246. Neely A, Gregory M., Platts K. (1995), Performance measurement system design: A literature review and research agenda, International Journal of Operations & Production Management, Vol. 15 Issue, 4, pp.80-116, https://doi.org/10.1108/01443579510083622. Pavan A., D’Onza G., Supino E. (2013), Innovare I sistemi di controllo e di governance per gestire il cambiamento, Management Control, Special Issue 2, pp. 5-7. Doi: 10.3280/MACO2013-002001. Tomkins C. (2001), Interdependecies, trust and information in relationship, alliances and networks, Accounting, Organizations and Society, 26, pp. 161-191. Doi: 10.1016/S0361-3682(00)00018-0.